The best things in life include a bottle of beer — at least in our vocabulary. I’ve heard a lot of beer-battered fish and chips but, in all honesty, I have never had any. There wasn’t any opportunity, I guess. Or maybe I just haven’t asked around enough AND I was skeptical. For a beer lover to be skeptical about using beer in cooking is somewhat akin to being a heretic. I had to remedy that. So, here’s my version of Shakey’s famous Mojo Potatoes: Beer-Battered Potato Rounds, a blend of two of my favourite gluttonic pleasures. Last Sunday, we had the slow-cooked pork ribs barbecue and it was the perfect time to try out my beer batter recipe. Since it was my first time cooking this, I didn’t want to ruin the taste so I didn’t do anything crazy like mixing minced chili or other whatnot. I stuck to the basic and just used the common ground peppers. We do not have an oven (it is on our wish-list and hope Santa is listening) or a deep fryer so we used a small pot instead. And for the potatoes to be cooked all the way through, we had to twice-coat and to twice-fry them — which was a stroke of genius, if you ask me! It made the batter crispier and the potatoes stayed moist on the inside. I don’t know if the oven would have been better but I will never know. For those looking for oven-cooked potatoes, this is not for you. But for those looking for great potato fritters, these are up there with some of the best fried potatoes I have ever eaten. No bias there, I swear. 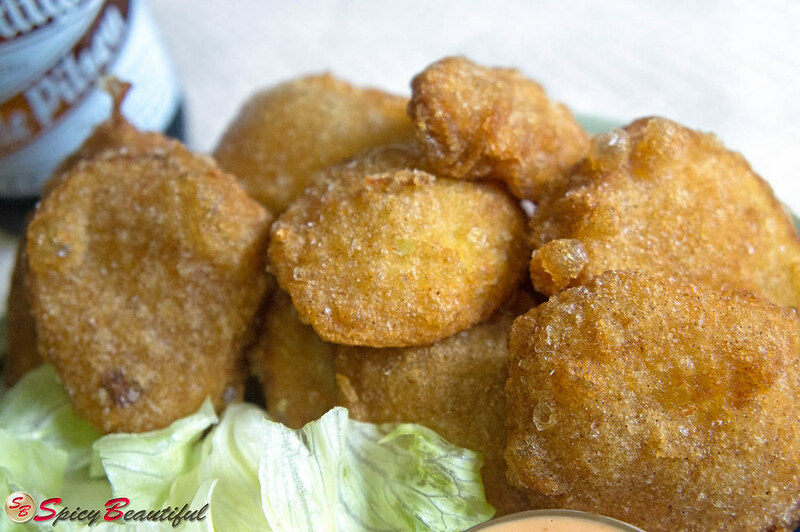 Potato mojos are still one of my favourites but this recipe is definitely at the top of my list for potatoes now! Now that I have tried this one, my mind is churning with ideas on how to make this more “spicy”. But for now, enjoy the recipe! 1. Wash the potatoes. Peel and cut into ¼-inch thick rounds. Soak in water for 15 minutes to remove some of the starch off. Drain water and season with salt, ground black pepper and ground red pepper according to taste. Cover and set aside. 2. Prepare batter by combining flour, cornstarch, salt, ground black pepper, red pepper and chili pepper. Gradually add beer while mixing thoroughly. Add more beer if necessary for the batter to reach the desired consistency. It should be thick but will still drizzle off your whisk. Refrigerate for 30 minutes. The cold batter will ensure that the coating will be crisp. 3. In a small pot or deep fryer, heat the oil. Dip each round in the batter and fry in batches of 3 for 2-3 minutes. Remove to a paper towel-lined pan or plate and allow to cool for 5 minutes or so. 4. Dip each fried potato round in the batter again and fry for 1 minute or until golden brown. 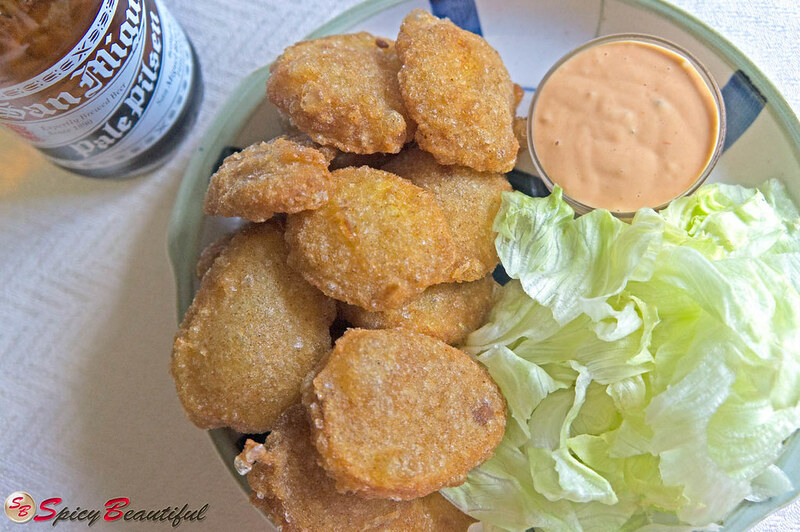 Remove fried beer-battered potatoes into a serving dish lined with paper towels to soak the excess oil. 5. Best served as a side dish to steaks or barbecues with a dip of your own choice. And, of course, with a bottle or two of your favourite beer! These look absolutely delicious, completely amazing. Lovely blog, I love phillipino cooking!